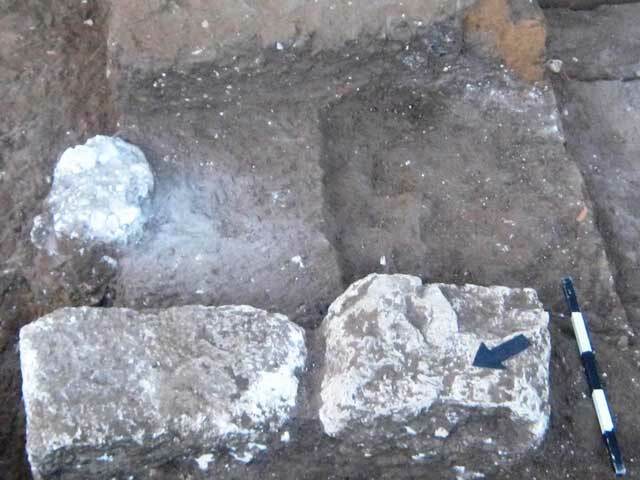 In September 2014, a salvage excavation was conducted in Ben Gurion Street, Ramla (Permit No. A-7202; map ref. 186821–71/647735–66; Fig. 1), prior to construction work. The excavation, undertaken on behalf of the Israel Antiquities Authority and financed by the Ramla municipality, was directed by V. Eshed (field photography), with the assistance of Y. Amrani (administration), M. Kahan and M. Kunin (surveying, drafting and GPS), M. Shuiskaya (pottery drawing) and H. Torgë (pottery reading). In recent years several excavations were carried out along the southern fringe of ancient Ramla, east of the current excavation area. Architectural remains dating to the Abbasid, Fatimid and Mamluk periods were discovered in the grounds of the municipal swimming pool when it was demolished prior to construction works (Toueg and Torgë 2014). Excavation south of the swimming pool uncovered remains of buildings and installations from the Early Islamic perio (Torgë 2013), and c. 50 m east of the pool, building remains were exposed. The remains included mosaic floors, large underground installations and cisterns dating to the Umayyad, Abbasid and Fatimid periods (ninth–eleventh centuries CE), as well as several sections of walls and remains of installations from the Mamluk period (Avni et al. 2008). The current excavation was conducted in the eastern part of the area slated for construction. 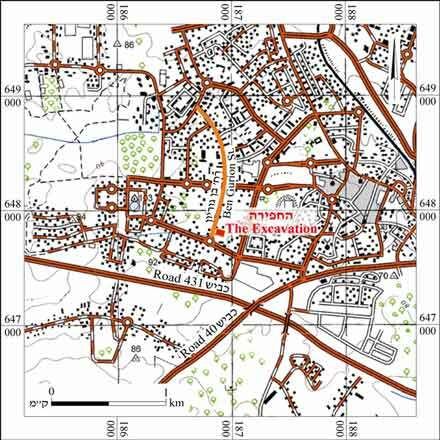 Two excavation squares (A and B, each 4 × 5 m) were opened after the removal of a fill to a depth of c. 1.5 m.
Square A. Remains of a small-fieldstones construction, possibly the foundations of a wall or a floor, were revealed in the eastern and western parts of the square (L10, L11, exposed length of each c. 0.7 m, width c. 0.15 m, exposed height c. 0.15 m; Fig. 2). 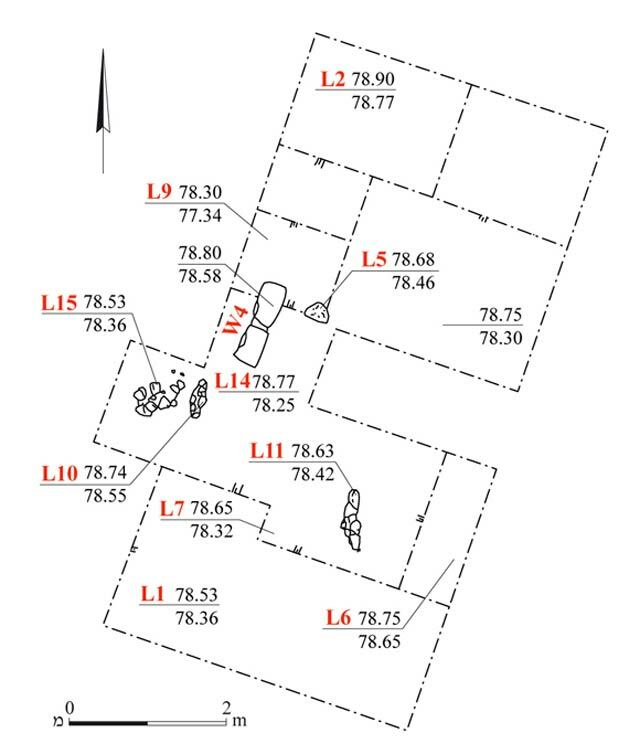 A concentration of small fieldstones, probably a floor foundation (L15) was found west of L10. Pottery sherds of a goblet (Fig. 3:9), a lamp (Fig. 3:10) and a steatite vessel (Fig. 3:12) dating to the Fatimid period (tenth–eleventh centuries CE) were found in the excavation square, down to the level of the floor foundation. Square B. 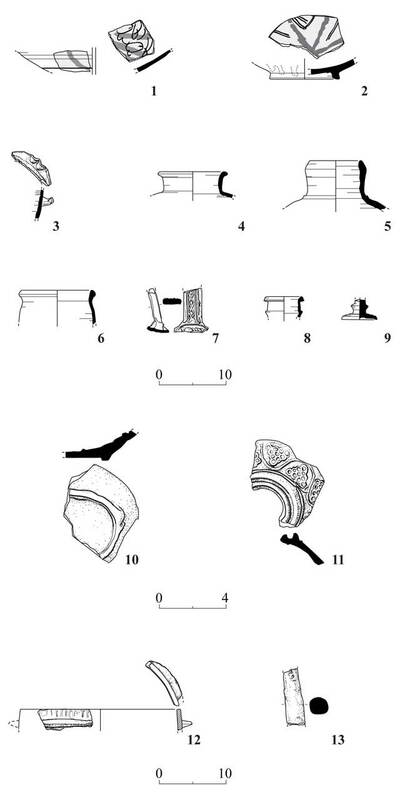 Two dressed fieldstones were discovered, probably the remains of a wall (W4; Fig. 4), which was oriented northeast–southwest and preserved to a height of one course. The date of the wall is not clear, however fragments of pottery vessels ascribed to the Fatimid period (tenth–eleventh centuries CE) were found above it: sgrafitto bowls (Fig. 3:1, 2), a cooking pot (Fig. 3:3), jars (Fig. 3:4, 5), jugs (Fig. 3:6, 7) and a flask (Fig. 3:8). In addition, ceramic wedges which were part of a kiln furniture (Fig. 3:13) and date to the Early Islamic period (ninth–eleventh centuries CE) were found. A lamp (Fig. 3:11) that dates to the Abbasid period (ninth–tenth centuries CE) was recovered from below the foundations of W4. An oval patch of white plaster (L5; diam. c. 0.3 m; Fig. 4), which may have been part of a floor foundation, was exposed east of the wall. Above the plaster were pottery sherds from the Fatimid period (tenth–eleventh centuries CE). Remains of a building from the Early Islamic period were exposed in the excavation, as were ceramic wedges, which suggest the presence of a potter’s kiln in the vicinity. Avni G., Avissar M, Baruch Y. and Torgë H. 2008. Ramla. HA-ESI 120. Torgë H. 2013. Ramla, David Raziel Boulevard. HA-ESI 125. Toueg R and Torgë H. 2014. Ramla. HA-ESI 126. 3. Pottery and stone vessels. 4. Wall 4, looking southwest.